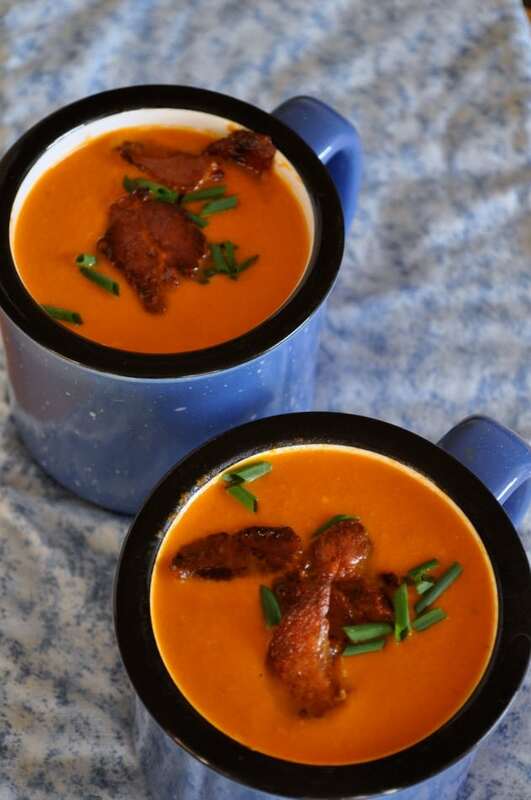 This dairy-free Tomato Soup with Basil and Bacon gets its creaminess from coconut milk. Quick and easy, and it’s paleo. 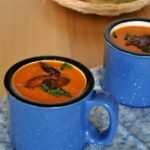 This Tomato Soup with Basil and Bacon has to be the easiest, fastest soup you could possibly make from scratch! Quickly sauté an onion, some celery and garlic in a little oil. Pour in two cans of organic tomatoes, broth, a can of coconut milk and some basil. Heat. Check the seasoning, then pour it into a blender or food processor to make it velvety smooth. Garnish with crispy bacon and more basil, and that’s it! Done! 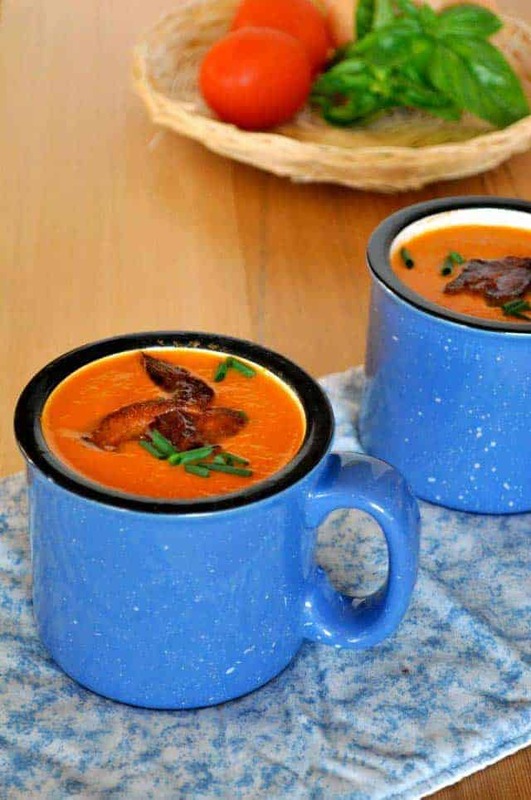 You have a dairy-free, richly flavoured homemade soup ready to serve. When I was a kid, Saturday lunch was usually a bowl of Heinz Tomato Soup (yes, Heinz, as apparently it was far superior to Campbell’s) and a grilled cheese sandwich. For a change, we’d have wieners and beans–a can of Libby’s Pork ‘n Beans which Mom personalized with a sliced wiener or two. These were Mom’s favourite lunches, not necessarily mine. Mom also loved bacon. Almost every day. She had this peculiar routine for eating her breakfast: begin with a bite of toast crust, follow with a bite of fried egg, and end with a nibble of bacon. Repeat. Toast, egg, bacon. Repeat. And end up, every time, with the most coveted morsels: the soft, butter-soaked center of the piece of toast, perfect for mopping up the last bit of the golden puddle of egg yolk, and a crispy tidbit of bacon, the climax of the breakfast experience. Save the best for last. Me? I avoided eating bacon for years and years. I’m not much of a pork fan, and the animal fat, salt content, and sodium nitrate in bacon just didn’t fit with my focus on health eating. I noticed something called “Bacon Ends” in my local hormone-free meat market. With little visible fat, I decided to pick some up for a dinner recipe I wanted to try. Oh boy! Little delectable chunks of double-smoked bacon made our dinner dish something to blog about (stay-tuned) and the memory of it made me decide to incorporate it into this Tomato Soup with Basil and Bacon, too. I was a little worried that adding coconut milk would change the flavour of this soup too much, but I was wrong. The basil gives it a fresh, bright taste and the coconut milk just makes it creamy and smooth, tempering the acidity of the tomatoes. So simmer a pot of soup, gather your family members to share it, and reflect on how each of their characteristics enhances each other and makes your family unique. And don’t forget the bacon. 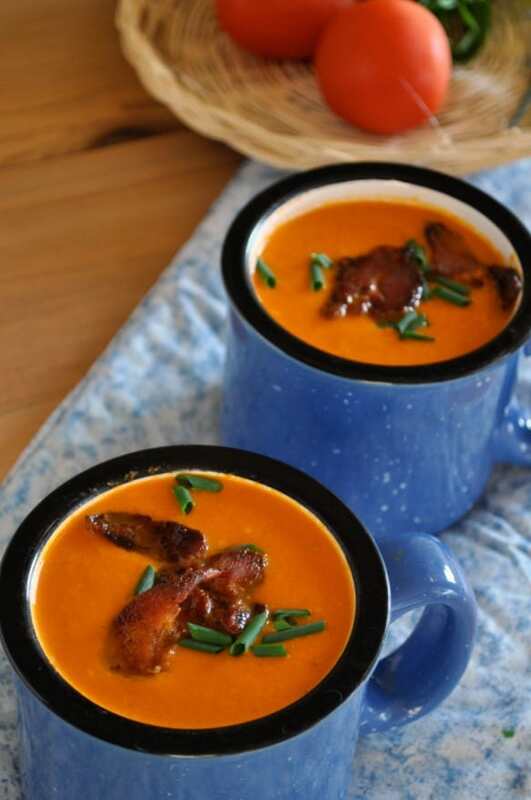 This Tomato Soup with Basil and Bacon is dairy-free. Coconut milk provides the creaminess but doesn't overpower the flavour. Quick and easy to prepare. Put oil in heated soup pot. Add chopped onions and celery and cook for about 5 minutes. Add chopped garlic and cook for another 2 minutes or so until the onions are translucent, but not browned. Add the canned tomatoes, the broth, the coconut milk and the basil. Puree in batches in a blender or food processor.